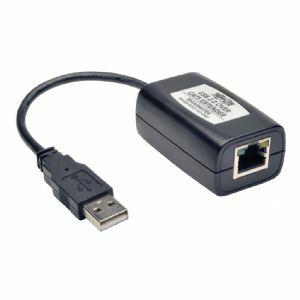 Tripp Lite's B203-101-PNP 1-Port Plug-and-Play USB 2.0 over Cat5/Cat6 Extender Kit transmits data from your computer to a USB 2.0 peripheral up to 164 ft. (50 m) away. It has plug-and-play functionality, meaning you don't have to install drivers or software. For added convenience, the transmitter has a built-in USB A/B cable for connection to your computer. The USB signals travel between the transmitter and receiver units over user-supplied Cat5/Cat6 cable. It's a simple, cost-effective solution for connecting your computer to a printer or other USB peripheral that lacks network connectivity and is farther than 16 feet away from your computer, which is the distance limitation for USB cables. For example, you can use the B203-101-PNP to connect an impact printer to a server in another room. This extender kit is also convenient for making connections in areas without network availability. By using Cat5/Cat6 cable to carry signals, the B203-101-PNP extends your installation farther than is possible with standard USB cables. Plus, Cat5/Cat6 cabling is readily available at low cost. For maximum signal integrity, use solid-conductor Cat5/Cat6 UTP cabling, such as Tripp Lite's N202-series. The B203-101-PNP extender kit can achieve data transfer rates up to 480 Mbps. It's backward compatible with USB 1.1 peripherals, but at USB 1.1 speeds. The B203-101-PNP works with all major operating systems (Windows and Mac). Complies with the Federal Trade Agreements Act (TAA) for GSA Schedule purchases.